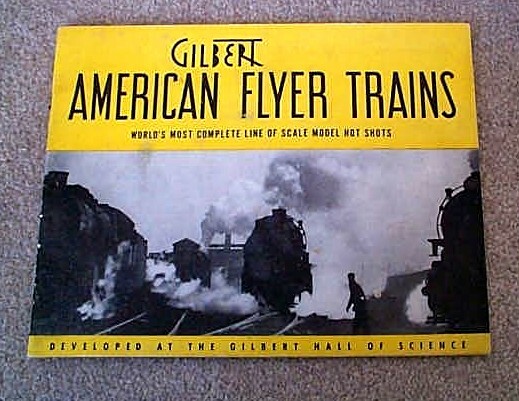 1940 Gilbert American Flyer Catalog (D1333) Very Good Plus Condition - $37.50 : Olson Hobbies, Welcome To The Train Page! 1940 A=Gilbert American Flyer Consumer Catalog (D1333). Some of the items listed in this catalog are the set no. 4006 Pathfinder Freight with no. 545 steam loco and freight cars; No. 4011, 561 Steam loco and passenger cars; 4017 set, with 572 Steam loco and passenger cars, along with set no. 4024 with 534 Union Pacific Steam loco and die cast passenger cars. Also shown is the Hard to find 584 Bell Danger Signal, and 582 Automatic Blinker Signal. A complete line of other accessories, track, and rolling stock is also offered. Slight water damage to top of all pages, othewise, appears complete.